In my previousÂ posts on community building on Facebook, I mapped outÂ a way to create a Facebook strategy and promote your companyâ€™s Facebook Page. Monitoring it continuously and making sure it occupies the right position in the consumerâ€™s mind, though, will require you to use the right analytics. YourÂ business objectives for launching a community on Facebook will define the metricsÂ you use toÂ measure and optimize the success of your community. For example, if you are building a community to promote your brand, you may want to measure the number of relevant target users that are part of your community and the quality of interactions with those users. Similarly, if your objective is to generate leads for your business, you may want to track theÂ number of relevant queries you receive through your efforts to build a community on Facebook. 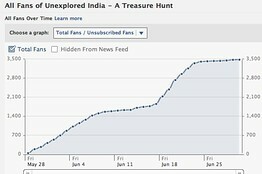 â€œUnexplored India â€“ A Treasure Huntâ€ is aÂ travel communityÂ on Facebook that was launched in one of our workshops and stands out as a niche yet, strong example. Within the first three weeks of its launch, this community grew to over 2,000 fans withÂ an exceptionally high degree of engagement (i.e. over 600 interactions per week). 1. Fan Growth: The number of fans (as well as unsubscribed fans) on your page over a period of time. In the latest version of FacebookÂ Insights, you can also seeÂ where fans came from. 2. Demographics: Given that Facebook is aware of the demographic details of its users, it provides highly relevant and useful demographic information comprising age, gender, location (country as well as city) and language. 3. Interaction: The extent of interaction is measured by page views, number of wall posts, likes and comments, which also tell you about the engagement pattern of your page. You can also get insights into what kind of content (text, photo, video etc.) is working or not working. 1. Facebook Grader: A tool designed by HubSpot to help you assess the ranking of your companyâ€™s Facebook page among other pages. 2. Social Page Evaluator:Â A tool designed by Vitrue to help marketers get a better understanding of a Facebook pageâ€™sÂ â€value.â€ Although it is not a perfectly scientific tool, it can be used as a good indicator to compare two Facebook pages. Here is another study by Vitrue to help you gauge the dollar value of each fan on your companyâ€™s Facebook page. 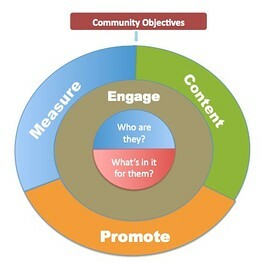 To summarize the complete process of launching and nurturing a community on Facebook, let me give you a framework which you can use as a guide to connect all the pieces of community building covered in this article series. Do let me know theÂ topics in digital marketing you would like me to write about. This article was originally published at WSJâ€™s India Chief Mentor.